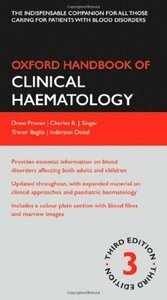 The Oxford Handbook of Clinical Haematology continues to provide the essential knowledge needed in modern clinical practice for the diagnosis and management of patients with disorders of the blood. Major advances in the specialty, primarily within the malignant haematology area, have been reflected in this thoroughly revised new edition. Agencies such as NICE have influenced the prescribing of chemotherapeutic and other related drugs, and there have also been updates from the British Committee for Standards in Haematology and other guidelines for malignant disease, thrombosis and haemostasis. This Handbook includes the main differential diagnoses and relevant investigations that will help junior doctors to arrive at a definitive diagnosis. The management of the patient is provided in a way that allows the junior to initiate treatment while waiting for review of the patient by a senior member of staff. 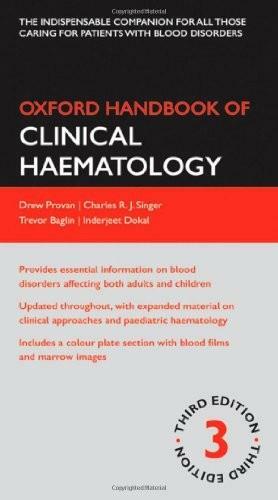 A bestselling Oxford Handbook, this is the indispensable companion for all those caring for patients with blood disorders.